The fourth of five 2018-dated U.S. quarters commemorates Cumberland Island National Seashore in Georgia. The 25-cent coin is the forty-fourth issue from the United States Mint series of America the Beautiful Quarters®, a multi-year program that runs from 2010 to 2021. Of note, this quarter represents the only one in the program to honor a national seashore. Others in the U.S. Mint’s coin series celebrate sites like national parks, national monuments, national forests and even national lakeshores. a coin exchange immediately after the launch ceremony. Coin forums offer an opportunity to learn about current and upcoming U.S. coins while coin exchanges offer an opportunity to swap cash for $10 rolls of new quarters. Finding new quarters is usually difficult, often taking months to years before they will appear regularly in change. Easier methods of getting them include coin exchanges and buying them directly from the U.S. Mint (www.usmint.gov). 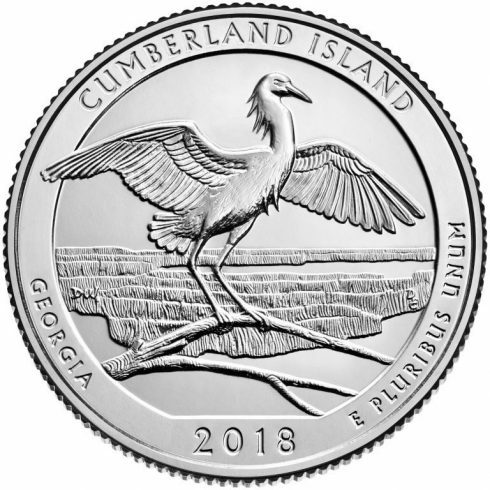 Thirteen proposed designs for the quarter’s reverse were developed by the U.S. Mint in consultation with representatives of Cumberland Island National Seashore. The Treasury Secretary selected the final design after the Commission of Fine Arts and the Citizens Coinage Advisory Committee reviewed them. Created by Donna Weaver and sculpted by Don Everhart, the winning design depicts a snowy egret posing on a branch on the edge of a salt marsh, ready for flight. Inscriptions include "CUMBERLAND ISLAND," "GEORGIA," "2018" and "E PLURIBUS UNUM." Quarter obverses (heads) share John Flanagan’s portrait of George Washington. Both obverse and reverse designs will also appear on a series of U.S. Mint bullion and collector 3-inch diameter, 5-ounce America the Beautiful silver coins. Rhode Island’s Block Island National Wildlife Refuge. The America the Beautiful Quarter series itself debuted in 2010 and features five strikes released annually. Each quarter features a unique reverse design emblematic of a site of national interest. One site was chosen from each state, the District of Columbia and the five US territories. Cumberland Island National Seashore of Georgia consists of over 36 thousand acres and was initially established by an Act of Congress on October 23, 1972. It is located on the southeastern corner of Georgia along the coast of the Atlantic Ocean. Cumberland Island is the largest of Georgia’s Golden Isles with the national seashore having beaches, dunes, marshes and even freshwater lakes. Visitors to the seashore can take in historic ruins such as the Dungeness, which can trace its history back to pre-Revolutionary War times, but is probably better known for members of the Carnegie family who built there. Limiting access to the island somewhat, it is only accessible by boat. Still, over 40 thousand annual visitors take the time to absorb the beauty and history present there.